There are lots of reasons to take your kids to Germany. 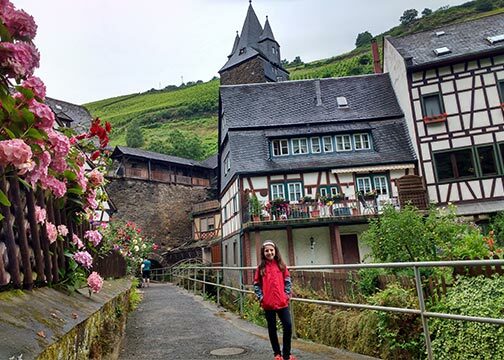 I recently traveled to Germany with my daughter. This was a special trip, connecting with her and connecting her with my homeland and her grandparents. But even if you do not have a personal connection like I do, Germany is a perfect destination for a family vacation. Here are some of my favorite reasons to travel in Germany with kids. 1. The Doll and Bear Museum “Loreley” in St. Goar. This was a favorite and is fun for kids and adults alike. There are other sweet little museums you will find tucked into villages in Germany. The boats are family friendly and well equipped, a perfect way to relax and take in the scenery. They even have slides and bouncers! Typically sold at Octoberfest and Christmas markets, they can be found at fairs and festivals year-round with a bit of luck. They are tasty fresh or make for a great souvenir. Nothing captures a kid’s imagination quite like a castle. The majestic Rhine River is lined with vineyards and castles. They are best seen from a KD River Boat. I was really surprised and delighted to find playgrounds all over Germany, in small towns and cities. Many were sturdy and lovely, made of wood, maybe even featuring a zipline! Share a table, and it won’t take long before a conversation starts. I was touched (and a little proud) at how sweet strangers were to us in our travels. What a relaxing and scenic way to get around. We could visit and enjoy the scenery from our train windows or cuddle up for a nap. We love train travel, and it doesn’t get much better than Germany’s efficient rail system. Yum…pretzel sticks for an appetizer. Modern German food is diverse and offers something for every palate. Tarte flambée enjoys great popularity in the Rhine region. A hiking trail in Germany is never far. Hiking is somewhat of a German past-time. Trails range from easy to challenging, and you can always find a restaurant along the way to recharge your batteries. Want to plan a trip? There are two German Untours to choose from, and both work very well for families and multi-generation travel. The German Castle allows you to stay in a medieval castle, and kids stay free with two paying adults. The German Rhine is another winner, with train and boat travel to picturesque villages in the castle-studded Rhine valley. Kids under 12 can go for just $200/week. See details here.